For one climber, an obsession with the vertical world wasn’t the source of destruction. It was the way out. I spent my first two years of college bruising my knees on bathroom tile. Some lonely people eat their lunch in the handicap stall. Others go there to throw it up. As descents into madness go, this one was slow and steady. If you wanted to, you could trace my downward spiral to age 15 when I started pinching my side in the high school lunch line to remind myself not to add dessert to my tray. I was running varsity cross country at the time. I wanted to be faster, and I wanted to look the part. The running habit, which had started as simple neighborhood jogs with my dad, had become part of my identity, and my vision of that identity came packaged in a glossy mental collage of both Olympians and my own lithe-limbed peers. If I wasn’t a runner, if I didn’t look like a runner, who was I? I folded inward and closed up. I grew smaller in ways that dress sizes don’t measure. I was willing to do almost anything to avoid answering that question. Pretty soon, ejecting meals became part of the daily routine. At the time, it didn't feel like hitting rock bottom. It felt like a new beginning. I sat back against the teal plastic of the stall wall and felt like I’d been let in on a secret that other people were just too afraid to try: a time machine that could unwind the guilt of a binge. Guilt and onion rings, which as you might imagine, aren’t as easy on the up as they are on the down. I actually burst a blood vessel in my eye doing it. I told my college roommate the bloodshot look was a one-two punch of sleep deprivation and a hard sneeze. It was a lie, but I had bigger things to worry about. At that point, my dad, the runner I had always tried to emulate and impress, was dying of cancer. My grades were slipping, my 5K times were rising, and I was drowning in the fear of failure. Drowning, you cling to anything that floats, any illusion of control. And the one thing I felt I had control over was my weight. Dropping pounds seemed like the only way to stay sane. I spent a lot of time curled up on bathroom floors, thinking about shrinking until I didn’t exist. Muscle melted away with fat, and confidence dwindled alongside my daily calorie count. The goal was always to become small, but it was startling what else I lost. I destroyed the relationship with my then-boyfriend and watched as one of my best friends’ body image crumbled in the shadow of mine. I canceled plans whenever they fell within the post-binge window. I lied to everyone I knew. I folded inward and closed up. I grew smaller in ways that dress sizes don’t measure. Climbing was having heroes who had broad backs and burly arms, not stick-thin frames. After a year and a half of wreaking havoc on my dental health, I dropped out of school. A week later, I scraped out 14 miles in the blistering Atlanta heat to cancel out calories and cried the whole way. Running, once a source of confidence, had become destructive. I needed another outlet. In 2013, after reenrolling in University of North Carolina at Chapel Hill, I signed up for a new course schedule and a belay class, mostly because it sounded cool, but also because I figured it would be hard to measure the calories I burned while climbing. There was no mileage, no stopwatch, no pressure. A lot of recovery is going to therapy, and a lot of therapy is trying to forget everything you think you know. Trying to get back to basics. Eating when you’re hungry, stopping when you’re full. Talking about your feelings. Doing things that make you feel good. Trying to ditch the baggage and act like a kid again. I spent my childhood high in swaying trees and knee-deep in north Georgia creeks. The girl I once was wouldn’t have recognized who I’d become. To get better, I needed to find her again. With all its exploring, wandering around outside, and crawling over rocks, climbing reminded me of who I used to be. Buying a pair of rock shoes was buying a ticket home. For some, climbing means losing sleep over projects, compulsively managing a tick list, and whittling a body to muscle and bone in a stand against gravity. The anxieties I see in some of my friends—especially those about image, reputation, fear of failure, and keeping up with everybody else—are old enemies. But for me, climbing was never about getting light or jumping grades. Climbing was being goofy. It was top-roping in a bicycle helmet. Climbing, I’m not curled up on the floor. I’m stretching. I’m reaching. I’m soaring. Climbing was having heroes who had broad backs and burly arms, not stick-thin frames. It was getting scared in the mountains, where it didn’t matter what I looked like. When incoming storms, runout pitches, and exposed ridges threatened, it was my body that carried me through. The body I once hated. The body I had bruised on bathroom floors. The body I had starved. Having an eating disorder is something you never really get over. It sinks further and further into the back of your mind, but it doesn’t ever really leave. Even if you want to forget, the biannual cavity fillings make it pretty hard. Maybe the constant reminders are a good thing. When I overhear gym talk about shaving weight for a project or notice friends fixating on performance and drawing into that soul-gnawing tunnel vision that I once had, I remember what it was like and take a step back. 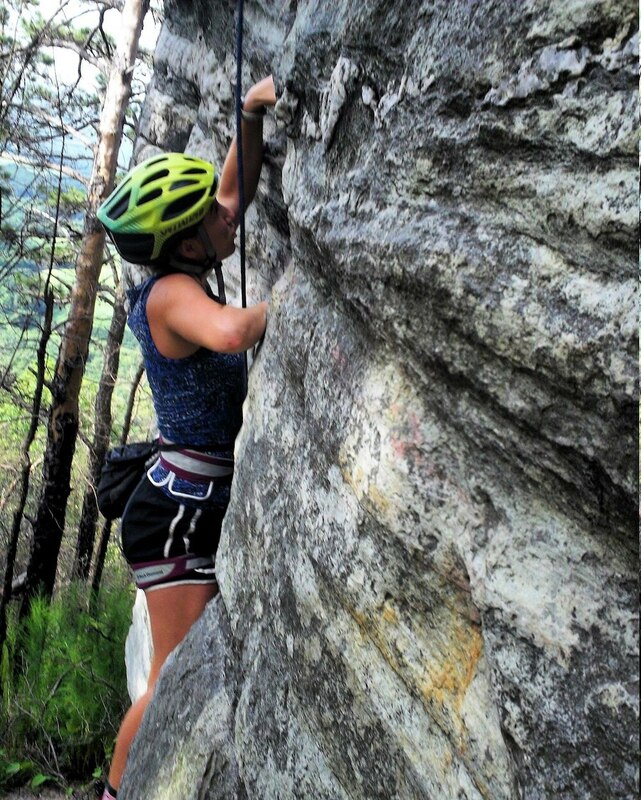 I think about bike helmets and letters from my dad, and I remember what climbing is supposed to feel like. I’d like to say that climbing saved me, that I conquered the metaphorical mountain with an actual one, that I’m cured. That would be an easy story to tell. The truth is that, however rare, there are still days where I spend 45 minutes locked in internal debate in front of a pastry counter with a fistful of dollars in one hand and an emergency exit map to the nearest bathroom in my head. There are days when I give in. But on those days—dozen-cupcake days or family-size-pizza days or triple-burrito days—instead of emptying out and closing up, I go outside. I chalk up. I tie in. Climbing, I’m not curled up on the floor. I’m stretching. I’m reaching. I’m soaring. Climbing has made me brave, and brave people can laugh in the face of a dozen donuts. Corey Buhay is an editor at Backpacker Magazine and a Boulder-based freelance writer. After a brief stint researching salamanders in the temperate rainforest of North Carolina, she moved west in search of dry rock. 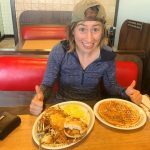 Now that she’s found it, she is able to devote more energy to searching for Waffle House. I love this. Thank you for your courage in writing this article, Corey. I can’t tell you how much I identify with it and appreciate you contributing to the very dire need for this discussion. You rock!! This is so beautiful. So are you. Thank you.